The year is 2035, and birth rates have dropped dramatically across Japan. The drop in student population, combined with large cultural shifts, have made it so attending high school is no longer considered mandatory. Seioh Academy is no different, with student morale at an all-time low. 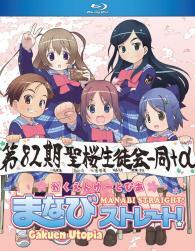 At the start of the new term, a boisterous girl by the name of Amamiya Manami--nick-name Manabi--starts life at this new school. Her enthusiastic passion lands her the job of student council president on her very first day of classes! Together with her classmates Mika, Mutsuki, Mei, and Momoha, will she be able to turn this school around and create the dazzling, exciting school life she’s always dreamed of?